Have you jumped on the simplified life bandwagon? Have you taken a few loads of unused stuff to a local thrift shop as a donation? Do you evaluate every purchase ruthlessly and even consider where you will store it before you buy it? Congratulations! I'm working towards that kind of simplified living too. However, I still find that my possessions -- the ones I truly need and am keeping -- have to be organized. But sometimes the organizers cost more than the items you are storing! We need realistic organization tools that help us sort things so they can be accessed when needed and keep them out of the way in the meantime. Over the door shoe organizers to the rescue! These inexpensive canvas or plastic dividers are great for storing small items besides your shoes. No space? No problem. 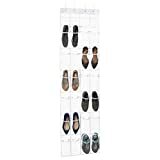 This over the door organizer lies flat against any standard door as you discretely store your shoes and stuff. 42 spacious pockets. The pockets on shoe organizers are not huge, so they work best for smaller items. Also, since you will be hanging the organizer on a door, you can't overload it with too much weight. Your collection of gold bullion is not a good candidate for these caddies. Here are three spots where shoe organizers work wonderfully. The photo to the left shoes quite an innovative use of a shoe caddy-- use it to plant seedlings! But it could also be used to hold garden tools, gloves, and seed packets. Hang the caddy on your shed or garage wall. In the garage a shoe caddy can hold all those odds and ends that seem to clutter up the area -- reusable shopping bags, various tools and gadgets, bungee cords, and umbrellas. The pockets on shoe organizers are commonly clear which makes them great organizers because you can see what is in each section. This is especially good for children who have trouble finding things. Hang a shoe organizer on the back of a closet door and multiply the available storage space for those small supplies that often get misplaced -- stapler, glitter, hole punches, glue sticks, paints, and stamps. Craft supplies are notorious for being difficult and expensive to organize. But a shoe caddy can coral everything into handy and visible sections. Imagine an organizer filled with ribbon, buttons, lace, hot glue sticks, thread, measuring tapes, tailor's chalk, beads, etc. To be even more organized, label the pockets or rows of pockets. If you like the clean counter top look, you might be struggling to find room in your kitchen to store all of your gadgets. Again, an over the door shoe caddy can work! Hang it on the back of a pantry door and load it up with utensils, pot holders, cookie cutters, toothpicks, napkins, spices, chopsticks, measuring spoons, and clothespins. In whatever room you use the caddy, it is a good idea to anchor it to the bottom of the door so that it doesn't swing around. Keeping it held fast to the door at the bottom will increase the life of your caddy since slinging it rips the grommets at the top. Use stick on velcro to affix the shoe organizer to the door. I use the shoe organizer when I cruise. There is NO space in the bathroom. These really help with organization and cut down tremendously on the bathroom clutter! I've never managed to use a shoe organizer for shoes, but I have one over my pantry door now, filled with all the little things that always get LOST in there: tiny bags of dried mushrooms or chopped nuts and so forth. And the lowest spots, of course, are filled with healthy snacks for the kids! I am surprised to see so many possibilities to repurpose simple hanging shoe organizer. Great tips! The shoe organizers can even be used for sorting Jewelry! They are very convenient. Looks very practical, especially if you're in a household with kids. 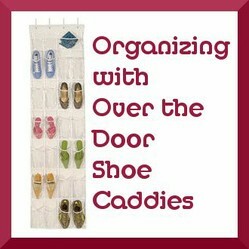 Some great ideas for over the door shoe organizers. We use them for small toys and hair accessories. I use mine for scrapbooking supplies. Over the door shoe organizer...who knew! I love these ideas. Now, where did I put that shoe organizer? Threw it out? Darn!